Tango offers Free Video Calls on Windows PC : Free Download | Free Pc to Phone Calls, Free Voip Calls to India International ! Desktop or laptops were the first thing on which the use of internet got popular. We started this blog with the aim to share new working ways to make free voice calls from PC (using internet). Things have changed so much now (specially after the arrival of smartphones). Now people use internet on their mobiles and use applications like Tango to make free video calls with them. Tango is a really a very popular application for making free voice and video calling. If you check the android or iPhone app store, you will see many voip applications, however one of the thing which distinguishes the best ones among the so many is its completeness. Just like ooVoo or Skype, this is one thing which I like about Tango. They have an application for Android Phones, Android Tablet, iPhone, iPod Touch, iPad, Windows Mobiles, most of Samsung mobiles, and personal computer as well. Infact Tango is planning to soon launch its blackberry app. In this post, we will be looking at the Tango Application for Windows PC. If you are not having smartphone, then these voip apps for your computer are very useful as you can call (text, voice or video) to a friend using Tango on my laptop. - Free Text, Voice and Video Calls to people who are also using Tango. - Make a call, it will auto detect if the contact is a Tango contact and your call will be free. Otherwise invite this person to use Tango. - Same sharing of your Tango account with your PC and mobile. - Visit this link, the exe will get download to pc. - Start Tango and register with your mobile number. This will make it easier for your friends to find you. 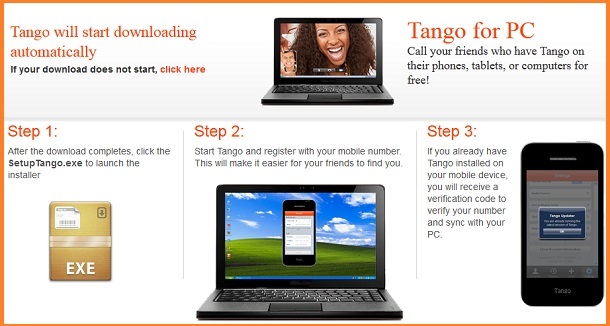 - If you already have Tango installed on your mobile device, you will receive a verification code to verify your number and sync with your PC. Tango for Mac is still not launched. We will keep you posted about the same. Compiled list of common question people have about Tango App for windows computer. Q. Not able to verify the app on PC. 2. Open Tango, Submit your registration information and click on Send Code. This should send your updated registration information to servers, and you should soon receive a validation code on your mobile device. 3. Once you have received the verification code, enter it on your PC and tap Submit. 4. If you are unable to receive the verification message you can click Resend Verification Code. If you are still unable to receive the code, you can click Resend code using SMS. Q. Not able to get Tango install on my PC. A. Please make sure that your PC supports the above said configuration (system requirements). Also make sure that your windows is fully updated. One more thing is to ensure that your graphics and sound card drivers are fully installed and updated. If this still does not work, then it could be a port issue. So, which ports need to be open to use Tango? - Please make sure the following ports are being forwarded in your router settings. Guys, we will update this list of questions based on the issue you are having. So please share your problems in the comment section and we will be happy to help.